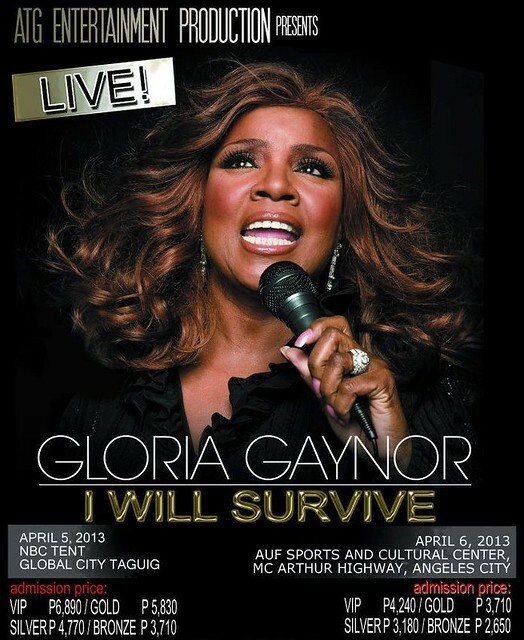 The one and only Queen of Disco is going to Manila and she'll be treating you to a more intimate night of great music at NBC Tent this coming April 5, 2013 at the Global City in Taguig. Watch as she takes you back on the dance floor once again singing her hits like "I will Survive", "Can’t Take My Eyes Off You” and “I Am What I Am". Who knows maybe Marice Soriano would pop up doing a dance number on that one haha (Oooh yeah I remember!). Plus, there will be a lot more other songs from her albums that you will surely enjoy! She will also be doing a second one on April 6 at the AUF Sports and Cultural Center in Angeles City Pampanga. It's going to be a huge 70's party so if you prefer to dress up for the occasion it would be great! I have always been a fan of hers since high school. I remember dancing to her tunes during ballroom practices back then. Her songs were just so amazing, I would love to see her in the flesh! This is Produced by people from ATG Entertainment Productions so you know you're getting only the best!